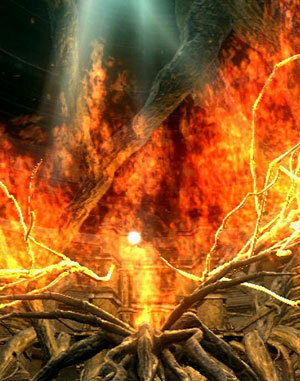 The Witch of Izalith attempted to duplicate the First Flame from a soul, but instead created a distorted being of chaos and fire. Its power formed a bed of life which consumed the witch and her followers: The Bed of Chaos, source of all demons. The Bed takes the form of a huge, gnarled tree, with a humanoid body shape. It attacks with two arm-like limbs, and eventually sprouts flaming limbs that resemble wings from an apparition on its back, with which it also attacks. An insect-like creature is seen to scuttle into the tree upon the player's approach, and must be slain to defeat the boss. The insect-like creature contains the Lord Soul belonging to the Witch, suggesting it is what remains of her after millenia spend in the Bed. Killing this boss will prevent Quelana of Izalith from appearing. If you want to upgrade your pyromancy to ascended, you have to do that before killing this boss. This fight works purely in phases, rather than incremental damage, and dying during it will not reset the phase. Dying will not restore the glowing roots, they are permanently destroyed, so you can destroy one root, die, then come back and destroy the other, die again, and then kill its heart. Quitting the game and reloading works too, you can simply kill one root, quit the game and, when you reload, you'll start outside the white light door again. After you defeat the boss, a Bonfire will appear which will allow you to warp out. Attacks with its hands in a horizontal direction. After destroying one object, a large appendage will appear on the boss's back, this has a longer range than the boss's hands and will attack the player with vertical swings. After destroying both objects, the two appendages that appeared can surround the player on both sides and create a flame pillar between them. After destroying both objects sporadic pillars of flame will burst from the ground. The location of these pillars is telegraphed by glowing orange circles appearing on the ground prior to activation. This attack is of particular noteworthiness as it may hit the player even inside the path to its "heart". An attack similar to the Demon Firesage's magic area of effect attack. It will activate when the player is standing in the area outside of the branches leading into the Bed of Chaos' heart. The main attack is the horizontal sweep attack, usually followed up by another attack in the opposite direction. This can be blocked with a high-stability shield, it can be rolled through but you run the risk of it dragging you with it (you will not take damage or be staggered). The scythe-like arms are best avoided, make note of where they are hitting as they can only hit certain spots. Watch for orange circles on the ground to avoid the fire pillars. Note these may appear anywhere on the map but only after both glowing roots are destroyed. Whilst inside the glowing orbs surrounding each root you are safe from harm. A three stage battle - first need to destroy each glowing root in the spheres, then drop into a hole in front of the boss to approach and destroy the core, a small insect. A glowing scythe-like appendage will grow as you kill each root, and after the second root is destroyed the boss gains extra abilities. 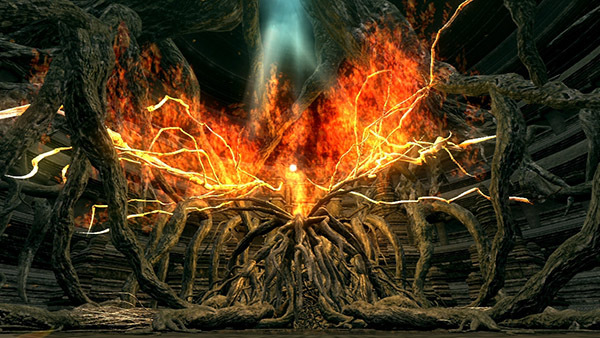 The core of the boss will not damage you and will die to most attacks (Will take more than one hit on ng+6 and beyond, on sl1 with the bare fist). A shield with high stability such as an upgraded Black Iron supported by the Sorcery spell Magic Shield and the Wolf Ring for extra Poise is recommended. This greatly reduces the chance of being staggered by the Boss attacks. Once you destroy a glowing root, the floor will begin to give way, sticking to the non-tiled band is a good rule of thumb to avoid falling. You can try to make your way back or immediately quit the game and reload it to be placed back outside the fog gate. The root will still be destroyed upon re-entering. This can be repeated for the second glowing root. Run to each glowing orb, roll or hack through the roots to get to the glowing root and hit it. Note it is preferable to do the quit-load technique to avoid having to navigate your way across the crumbling floor as falling will mean a long run from the bonfire. The left glowing root can be destroyed with a bow and the Hawk Ring - as you will not have to travel the distance to get to it this is preferably done after the right root is destroyed. Run along the wall towards it, you will pass under a root and come to a point where another root is blocking your path. 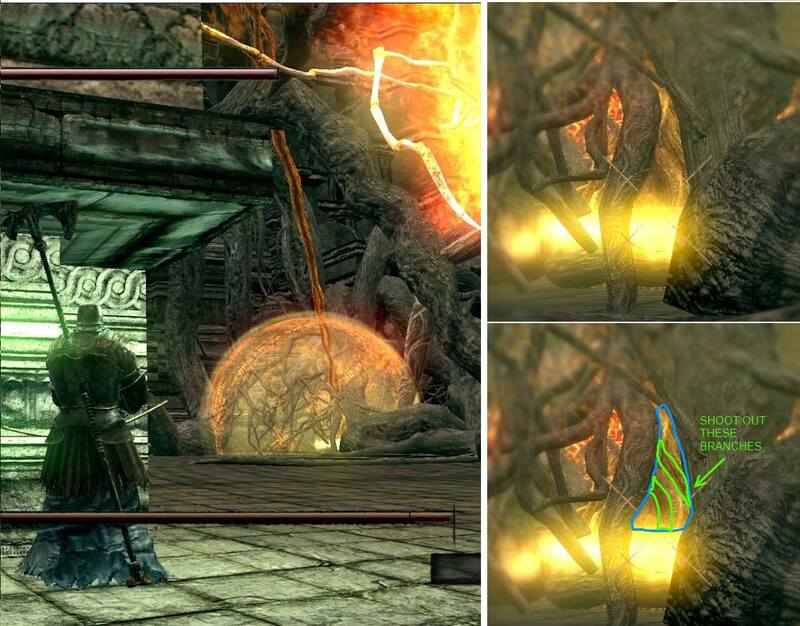 From the corner before that point, you can take out your bow and shoot the root. View an image here. Getting to the heart of the boss is the trickiest part of the "fight". You need to fall into the hole directly in front of the boss onto a narrow root-path that leads up to the core. The boss will attempt to knock you off as you are falling with its sweep attack, and as it repositions its right appendage (on your left) it can knock you off as you approach the entrance to its core. The standard technique is to approach head-on, run as far up as you can (not too close to the edge) and block or dodge the two sweeping attacks. You may have to wait for a second pair of attacks if you did not make it close enough the first time. If blocking you will need to turn to block each attack. Once you are close enough and have just blocked or dodged the second sweep, roll onto the branch below. This is easiest to judge by running off the little platform of tiles sticking out just to the right. Wait a moment for the second sweep to finish, you will note its right appendage will brush over the top of the path and will knock you off if you are too far up. Proceed into the heart of the boss. Another approach is to use the big root as cover first. From where you land at the beginning of the fight, look to your left, there is a big root coming out from the ground. Run for it and stay behind it, the boss can't hit you here. Wait for the scythe attack and run forward, once the boss starts swing his arms get back a little, once she is done with the arms swing attack, sprint forward (aiming for the root inside the hole) and jump. You should land right on the root that takes you to the boss's heart. Sometimes the game freezes when trying to jump down to the branch to get to the heart. Whenever you go back to fight it, there is still a hole in ground but the game doesn't fully register it so when you approach the boss at the point where the floor is supposed to break, you can see debris falling (although the floor has already collapsed) and the game freezes. To fix this problem, go back to Firelink Shrine then warp back to Daughter of Chaos and make your way back to the boss. This seems to reset the floor, so when you go back the hole is sealed, and then collapses successfully with no freezing and you may continue the game.